By summer's end, does your lawn green on top, but brown underneath? When you mow it, does it look dead and scalped? Thatch is a layer of living and dead grass stems and roots. 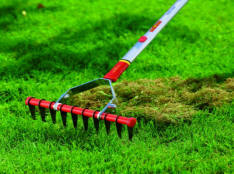 It is the natural consequence of a healthy lawn, For best results, dethatch your lawn about every one to two years, in March or April or in the early fall. It is best to fertilize after this has been done. It is an interwoven layer of mostly dead roots, crowns, and stems, located between the soil and the green lawn. Lawn thatching is an important trick of the trade that Landscapers use. Since thatch builds gradually beneath the grass surface, it is understandable why most people overlook this important task.